Marsha Hunt played a maid who penned a tell-all memoir opposite Richard Carlson in the 1942 romantic comedy The Affairs Of Martha. Marsha Hunt sits at her house in Los Angeles earlier in 2018. When you're caught up in the turmoil of the moment, it can be good to take the long view. So: Meet actress Marsha Hunt. Now 100 years old, she was part of the golden age of Hollywood, and then the golden age of live television. She lived through the McCarthy era and survived the Hollywood blacklist and still held onto her ideals. Hunt usually played the good girl in comedies and dramas, Westerns and war movies, and even in gritty pictures like the 1948 film noir classic Raw Deal. She plays a legal caseworker who falls for a killer, but finally gets wise. The movie wasn't considered much at the time, but it's become a cult icon and is now one of the roles for which Hunt is best-known. Though she grew up in New York, what she wanted was Hollywood. After high school and a brief modeling career, the tall brunette with luminous eyes landed a contract with Paramount Pictures. She was just 17. "I had blind confidence," she says at her home in Los Angeles. "Predestined: I was going to be a film actress." And she was a busy one. In the 1930s and 40s she appeared in more than 50 films. She often played romantic leads, but loved the chance to play less glamorous parts, like the plain, quirky Bennet sister in Pride and Prejudice. She had at least three roles where she portrayed old women while she was still in her 20s. These were roles "where you started young and aged throughout the story," she says. Hunt's recall of people and events that really mattered to her is strong. But she is sometimes foggy on the details. She'll remember her co-star on a project, but not the name of the picture. Or she'll remember a film she was in, but not the other actors. She has a standard answer for that. "You know, I am 100," she says, laughing. When Hunt appeared in big-budget pictures, she usually played supporting roles. Her leads were mostly in B-movies, the less expensive films that filled out a double feature. One such movie, the 1942 comedy The Affairs of Martha, was about a wealthy town which learns that one local housemaid has written a tell-all book. The secret author is Hunt's character, of course. Her dialogue foreshadows her fight for the First Amendment a few years later. "Well, there's nothing shameful about writing a book, is there?" she says, as she rallies her nervous fellow housemaids. "There's nothing in the Constitution that says you can't, is there? ... It's a matter of principle!" Hunt lost her career over a matter of principle. In the late 1940s, she publicly supported a group of writers, directors and producers who'd been accused of being Communists and were called to testify before the House Un-American Activities Committee. "If you were liberal, that to some people meant 'Communist,'" Hunt says. "And of course that was the dirtiest word in that period that could be used about anybody." Hunt is the last surviving member of what was known as the Committee for the First Amendment. It was a group of a few dozen big Hollywood names, including Humphrey Bogart, Lauren Bacall, John Huston and Judy Garland. They produced a radio show called Hollywood Fights Back, protesting HUAC as itself un-American. And several members, including Hunt, flew to Washington, D.C. to show support for the writers and directors who'd been called to testify before HUAC. "I was there with pride and great excitement," Hunt says. "Because we were testing what I had grown up believing in: free speech and love of country. And to find that there were people who questioned that was appalling to me." But not long after that trip, the Committee for the First Amendment was accused of being a Communist front organization. It fell apart. Some members recanted. Others claimed they'd been duped. But not Marsha Hunt. "Mind you, I wasn't a big star," she says. "And I was never asked to recant. I guess they knew I wouldn't." In 1950, Hunt's name appeared in Red Channels, a publication that named alleged communists. That's all it took. Her movie work dried up overnight. Even when the blacklist ended, her career never returned to what it was. The blacklist hit some people hard. They succumbed to the bottle, died young or spent years in exile. But Marsha Hunt found a new dream to pursue. When her name appeared in Red Channels, she was working on Broadway, where the blacklist didn't seem to matter much. So she continued to work on the stage for a while. She also worked in some of the first live television dramas broadcast nationwide. "That was trailblazing," she says. The networks hadn't yet been doing simultaneous broadcasts coast to coast. "Everything was brand new." When Hunt returned to Los Angeles, she threw herself into charity work and found a new outlet for her political activism — as an advocate for the United Nations. "The first time I heard the term, I thought: the United Nations, yes!" Hunt says. "That means no war. That means getting along with each other. And that's for me. So how can I help?" She helped by making speeches to encourage support for the U.N. She also produced a 1960 documentary A Call From (renamed A Call from the Stars in 2009) about the plight of refugees around the world. It was written by her husband, screenwriter Robert Presnell, Jr., who died in 1986. She still lives in the house they bought in the 1940s, and gazes with joy at his fading photograph over the mantelpiece. "I was so lucky," she says. "He was brilliant and fun and philosophical. We had all there was." Now, the frailties of age have curtailed the activism and charity work to which Hunt devoted decades of her life. She uses a hearing aid. She walks with assistance from a cane or a walker. And she doesn't see well enough to read. "So I have to get the news on the air rather than my newspaper or magazines," Hunt says. "And that changes the degree of awareness. I hope I know what's going on, but not in the detail that I used to and that I treasured." But she doesn't worry much about the details now. What Hunt treasures are the milestones in her life and the memories of the people she shared them with. Here's something pretty wonderful. Meet actress Marsha Hunt. Now 100 years old, she was part of the golden age of Hollywood and then the golden age of live television. Off screen, she lived through the McCarthy era and survived the Hollywood blacklist and still held on to her ideals. NPR's Ina Jaffe met her at her home in Los Angeles. 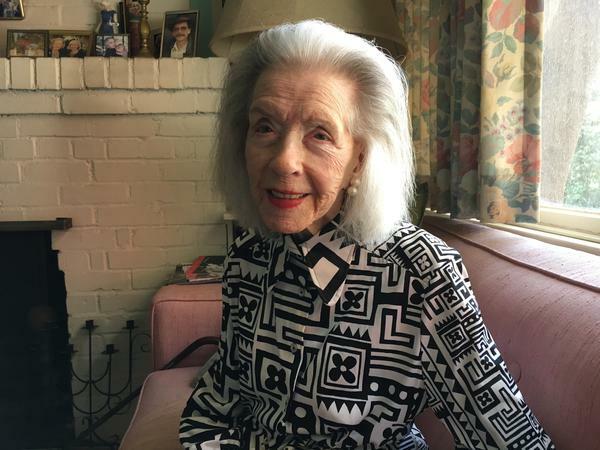 INA JAFFE, BYLINE: Marsha Hunt usually played the good girl, in comedies and dramas, westerns and war movies, even in gritty pictures like the 1948 film noir classic "Raw Deal." MARSHA HUNT: (As Ann Martin) You think you had to fight, but the only way you know how to fight is that stupid way with a gun. JAFFE: Hunt plays a legal caseworker who falls for a killer but finally gets wise. HUNT: (As Ann Martin) It's the daily fight that everyone has to get food and an education, to land a job and keep it and some self-respect. Safe - I never asked for anything say. All I want is just a little decency. That's all. JAFFE: Marsha Hunt knew what she wanted from an early age. Though she grew up in New York, she wanted Hollywood. After high school and a brief modeling career, the tall brunette with luminous eyes landed a contract with Paramount Pictures. She was just 17. HUNT: I had blind confidence, predestined. I was going to be a film actress. JAFFE: And she was a busy one. In the 1930s and '40s, she appeared in more than 50 films. She often played romantic leads but loved the chance to play less glamorous parts. HUNT: I did play four old women before I was 21, and I think that's true. And that's not usual, but these were aging where you started young and aged throughout the story. JAFFE: We could only find three such films that she made in her 20s. So while Hunt's memory for the important things is still strong, she knows she's foggy sometimes on the details, and she has a standard answer for that. HUNT: You know, I am a hundred (laughter). JAFFE: When Hunt appeared in big-budget pictures, she usually played supporting roles. Her leads were mostly in B movies, the less expensive films that filled out a double feature, like "The Affairs Of Martha." JAFFE: In this 1942 comedy, the housemaids in a wealthy town fall under suspicion when word gets out that one of them has written a tell-all book. Marsha Hunt plays the secret author who rallies her fellow housekeepers. HUNT: (As Martha Lindstrom) There's nothing shameful about writing a book, is there? There's nothing in the Constitution that says you can't, is there? UNIDENTIFIED ACTOR: (As character) Hear, hear. HUNT: (As Martha Lindstrom) It's a matter of principle. JAFFE: Hunt lost her career over a matter of principle. In the late 1940s, she publicly supported a group of writers, directors and producers who'd been accused of being communists and were called to testify before HUAC, the House Un-American Activities Committee. HUNT: If you were liberal, that to some people meant communist. And of course, that was the dirtiest word in that period that could be used about anyone. JAFFE: Hunt is the last surviving member of what was known as the Committee for the First Amendment. It was a group of a few dozen big names, including Humphrey Bogart, Lauren Bacall, John Huston and Judy Garland. UNIDENTIFIED PERSON: "Hollywood Fights Back." JAFFE: This was a radio show produced by the Committee for the First Amendment protesting HUAC as itself un-American. JUDY GARLAND: This is Judy Garland. JOHN HUSTON: This is John Huston. LAUREN BACALL: This is Lauren Bacall. HUNT: This is Marsha Hunt. HUMPHREY BOGART: This is Humphrey Bogart. JAFFE: Several members, including Hunt, flew to Washington, D.C., to show support for the writers and directors who'd been called before HUAC. HUNT: I was there with pride and great excitement because we were testing what I had grown up believing in - free speech and love of country. And to find that there were people who questioned that was appalling to me. JAFFE: But not long after that trip, the Committee for the First Amendment was itself accused of being a communist front organization. It fell apart. Some members recanted. Others claimed they'd been duped but not Marsha Hunt. HUNT: Mind you, I wasn't a big star, and I was never asked to recant. I guess they knew I wouldn't. JAFFE: In 1950, Hunt's name appeared in Red Channels, a publication that named alleged communists. That's all it took. Her movie work dried up overnight. Even when the blacklist ended, her career never returned to what it was. The blacklist hit some people hard. They succumbed to the bottle, died young or spent years in exile. But Marsha Hunt found a new dream to pursue. When her name appeared in Red Channels, she was working on Broadway where the blacklist didn't seem to matter much. So she continued to work on stage for a while. She also worked in some of the first live television dramas broadcast nationwide. HUNT: That was trailblazing. Everything was brand new. JAFFE: When she returned to Los Angeles, she threw herself into charity work and found a new outlet for her political activism as an advocate for the United Nations. HUNT: The first time I heard the term, I thought the United Nations, yes, that means no war. That means getting along with each other, and that's for me. So how can I help? JAFFE: She helped by making speeches to encourage support for the UN. She also produced a 1960 documentary about the plight of refugees around the world. It was written by her husband, screenwriter Robert Presnell Jr. who died in 1986. She still lives in the house they bought in the 1940s and gazes with joy at his fading photograph over the mantel piece. HUNT: I was so lucky. He was brilliant and fun and philosophical. We had all there was. JAFFE: Now, the frailties of age have curtailed the activism and charity work to which Hunt devoted decades of her life. She uses a hearing aid. She walks with assistance from a cane or a walker, and she doesn't see well enough to read. HUNT: So I have to get the news on the air rather than in my newspaper or magazines. And that changes the degree of awareness. I hope I know what's going on but not in the detail that I used to and that I treasured. (SOUNDBITE OF PETER SANDBERG'S "THE WARMTH OF THE SUN ON HER SKIN") Transcript provided by NPR, Copyright NPR.